In looking for a straightforward WYSIWYG editor for Markdown code, I am not finding a comparible UI to that of CkEditor, TinyMCE, ect. 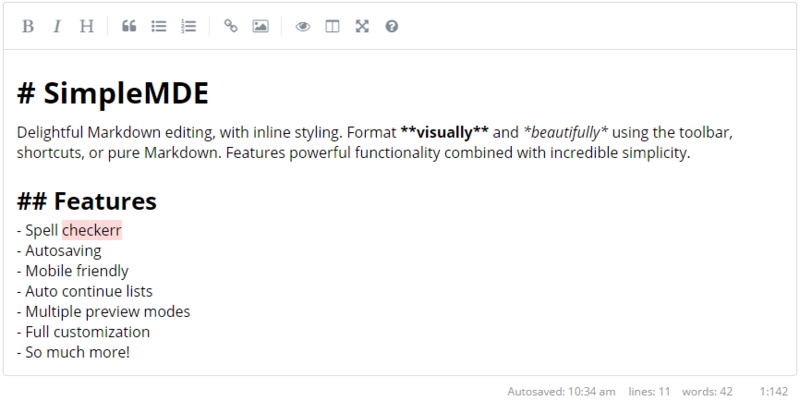 Specifically, the Markdown "WYSIWYG" editors that are often recommended (such as posts like this ) are not pure WYSIWYG editors in the sense that users either still write raw Markdown ( MarkItUp ) or go to the other extreme of having in-line editing without standard controls ( Hallo ). I get the reason for Markdown/wiki, ect - the security it offers. I don't mind entering raw code like here at SE, but my users are not geeks and do not find this enjoyable. They don't want to see * * * ___ and spaces mixed in with their text. They are used to "Word" style editing, and are most productive in that environment. 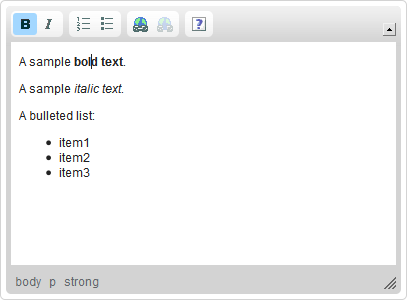 So - is there a truly integrated WYSIWYG editor for Markdown? I'm writing in a PHP, so something that I can invoke with a class would be perfect. CKEditor now has a Markdown addon that does this exact thing. The addon project is hosted on github. Someone professing to develop CKEditor says that the appearance of CommonMark is a game changer, and we could possibly see a proper markup interface for CKEditor (read comments for the full story). CKEditor now comes with a plugin that outputs (and accepts as input) BBCode. I was researching in this subject the other day and I haven't found any decent WYSIWYG editor with Markdown output. In fact, first you have to have to create a WYSIWG Markdown editor is WYSIWG HTML editor and there are just few of them that are usable on the market. There's a chance that you'll be able to create dataProcessor for CKEditor that will change HTML editor into Markdown editor. We've got a plugin for BBCode that works like this (check out http://nightly-v4.ckeditor.com/3737/samples/bbcode.html). All you have to do is implement this interface http://nightly-v4.ckeditor.com/ckeditor_api/#!/api/CKEDITOR.dataProcessor. If you check BBCode plugin's code you'll see some hacks and tricks, because unfortunately current CKEditor's architecture isn't ready (yet) to create such a data processor. However, I believe that if you want to provide only few styling options you should be able to implement Markdown support pretty quickly. SimpleMDE, a newcomer, may be the answer. I've been searching for something just like this for a month now. I'm surprised that this does not show up higher in search results. I had to go through a notice on lepture/editor to find this. As posted in my Feb 6, 2015 update, CKEditor now includes plugins that allow BBCode input and output. Pen is a new (active as of 2014) WYSIWYG editor that outputs Markdown. It's not perfect—I've had issues with pasting HTML there—but it works. Still, I'll leave it here as an option since some people upvoted this answer and it may have been of use to somebody. I implemented a very simple editor that allows the contents of a <textarea> that contains Markdown to be edited in a WYSIWYG fashion. I used Hallo. I don't think its web site makes it obvious that it is not itself a Markdown WYSIWYG editor but the demo does forge the path to one. If the <textarea> is a field in a <form>, then the edited Markdown will be sent to the server when that form is submitted. The inspiration for this comes from the Hallo Markdown Example, specifically the editor.js file. I used that as a basis for my own script along with hallo.js, showdown.js and to-markdown.js. There are other dependencies: JQueryUI and Rangy (Rails users can avail of the gems jquery-ui-rails and rangy-rails). Also Font Awesome is used for the tool bar icons. The version of hallo.js used by the demo is out of date (it uses an old version of Font Awesome) - use hallo.js from GitHub instead. You only need to add CSS class='wysiwyg' to any <textarea> to enable WYSIWYG on it. The <textarea> should conain Markdown formatted text. I would expect that wysiwyg.js could be easily adapted to use another editor if you don't like Hallo as long as it works on the HTML in a <div>. There are quite a few to choose from but not all are as lightweight as Hallo. A smilar piece of work that I found is markdown-html-form. It uses the same Showdown and to-markdown. That seems pretty close to what we are looking for, it does a reasonable job of taking your WYSIWYG rich text and outputting markdown. However it failed on an encoding exception when I pasted in some rich text from a google doc. Not the answer you're looking for? Browse other questions tagged ckeditor richtextbox markdown wysiwyg or ask your own question. Can you suggest a Non-HTML WYSIWYG web editor?